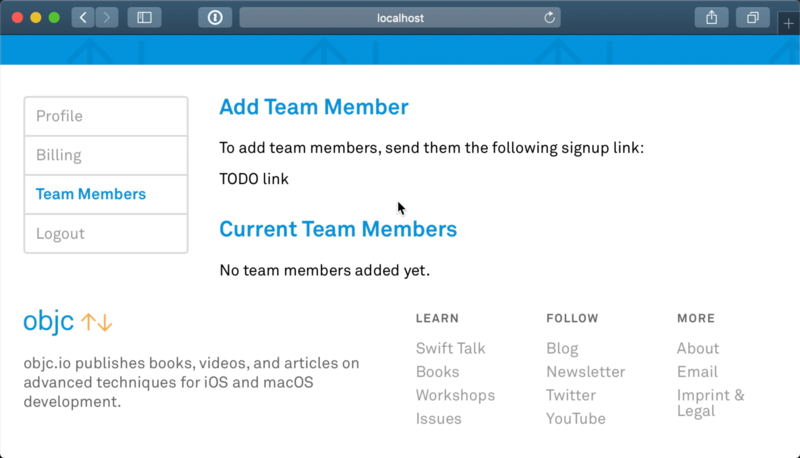 We show our new Swift Talk backend built on top of SwiftNIO by implementing a new team member signup feature. 00:06 Today we'll have a first look at the implementation of our Swift Talk backend in Swift! We started rewriting it two years ago, and this version has been online for a while already. 00:28 We want to show how the backend works, but building it from scratch would be a bit boring. So instead, we'll start implementing a new feature, and along the way, we'll explain the different aspects of the backend. This isn't ideal because the team manager might not know the username, which means they'd have to ask the invitee before being able to invite them. 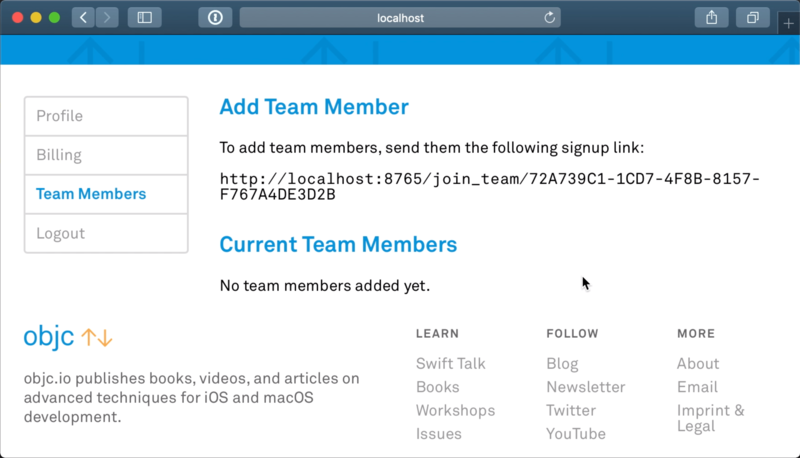 We want to reverse this: we want to show a signup link that can be shared with the people who may join your team, which will allow the invitees to sign up with their own GitHub accounts. 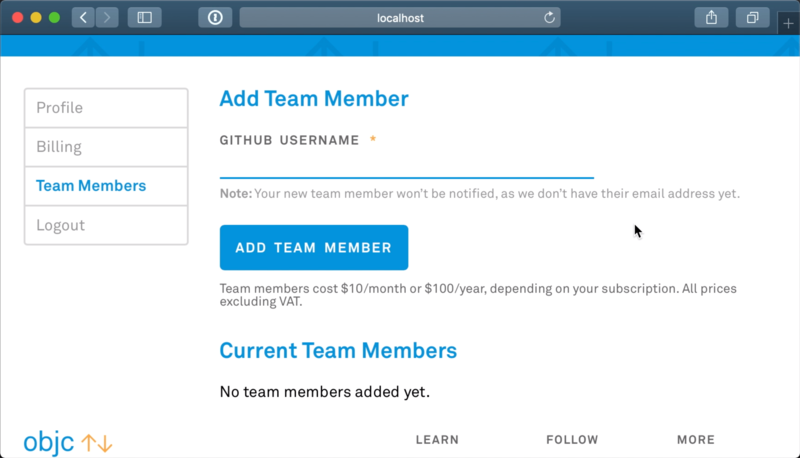 04:21 We can remove the team members form we used to pass into the teamMembersView function, as well as the helper that created the form. After doing this, we get a compiler error about the call site in another part of the codebase. 05:00 When the server receives a request from the browser, we turn that request into a Route — an enum with cases such as the homepage, an episode page, and the team members page. The interpreter then interprets this enum. We can think of the interpreter as the controller, while the Nodes are comparable to views of an iOS app. Having this separation allows us to swap out the server interpreter with a test interpreter, the latter of which skips all of the server infrastructure. 07:20 The object we're returning from, I, is the response type, and one of its helper methods is redirect. We redirect to another route using the same enum as the one that gets interpreted as a request from the browser. By only representing internal links with an enum, it's impossible to create an incorrect internal link; the compiler simply won't let us. 08:39 The next step is generating a token for the signup link and saving this token to the database. We've chosen to use PostgreSQL for our database, and we write our SQL queries manually (with the exception of a few helpers we use to perform some simple queries). We prefer writing a few queries over adding a large abstraction layer that may hide some of the many useful features of SQL. 10:33 Each time the server starts, all of the migrations are run. This requires us to pay attention and write our queries in such a way that they can be safely executed many times — note the IF NOT EXISTS conditions in the two examples above. 11:38 We run the server and, not having received any errors, we conclude that the migrations have been performed successfully. So we can now also add the team token to our user model. 11:59 We use Codable to automatically generate queries from a struct (something we covered in a previous episode), and also to parse query results back into this struct. Each table is represented by a struct, and we also have some structs for specific queries. 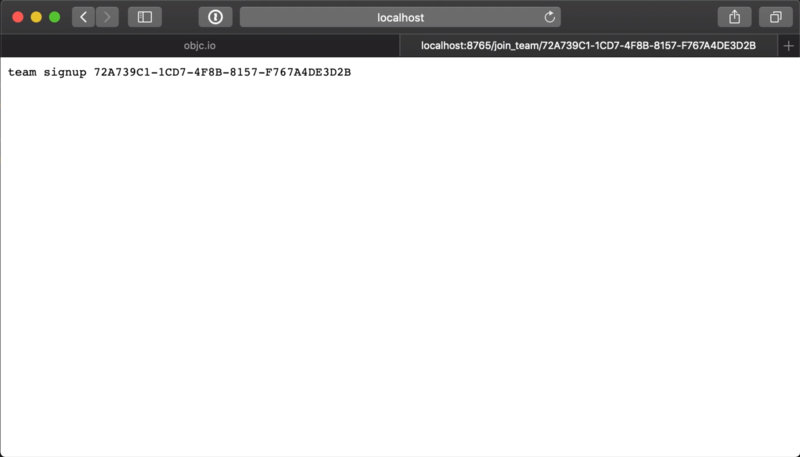 static let tableName = "users"
13:06 When we run the server and reload the page in the browser, a team token should have been loaded from the database into our user data. But we have no way of knowing, because we're not yet using the token. 14:39 We simply store the parameters of a Route in the correct type, like UUID here, as long as we're able to convert the type from and to a request. By the time we're in one of the interpreting functions, we already have all the parameters we need to process the request. 15:15 We wrote a (slightly complicated) library to support the Route enum, and we won't go into much detail, but adding a new Route essentially comes down to specifying how to convert a request to that Route and how to convert the Route back to a URL. 18:27 Because the library does most of the work of parsing requests (including the parameters) and generating URLs, the main focus has shifted to the conversions between the UUID parameter and the Route. 22:24 We can try messing with the URL and removing a character from the token; this results in a "page not found" error. That's because the router tries to parse the string "join_team" and a UUID, and if it can't, there's no route that matches with the URL. It's a good first check that the route only works with a valid UUID. However, we're not yet checking whether the requested UUID is in fact a valid token in the database. 23:22 So far, we've already seen a few different parts of our backend's infrastructure: we modified a view, we added a database migration and updated our database model, and we added a new route and a minimal response for it. 23:39 Everything is built directly on top of SwiftNIO. Not using any other frameworks in between makes some parts, like driving the database, pretty bare bones. But this also helps us remain efficient: we can write exactly the queries we need. And SQL itself is a high-level language, which we couldn't write better ourselves. 24:42 In the upcoming episodes, we'll finish the team token signup flow, for which we'll have to query the database. We'll also add a button to invalidate the signup link by generating a new token, and we'll write a few tests at some point.